Because carp are an introduced species in North America, carp don’t have a native range. All of the following carp, except silver and big head carp, are found scattered across North America. 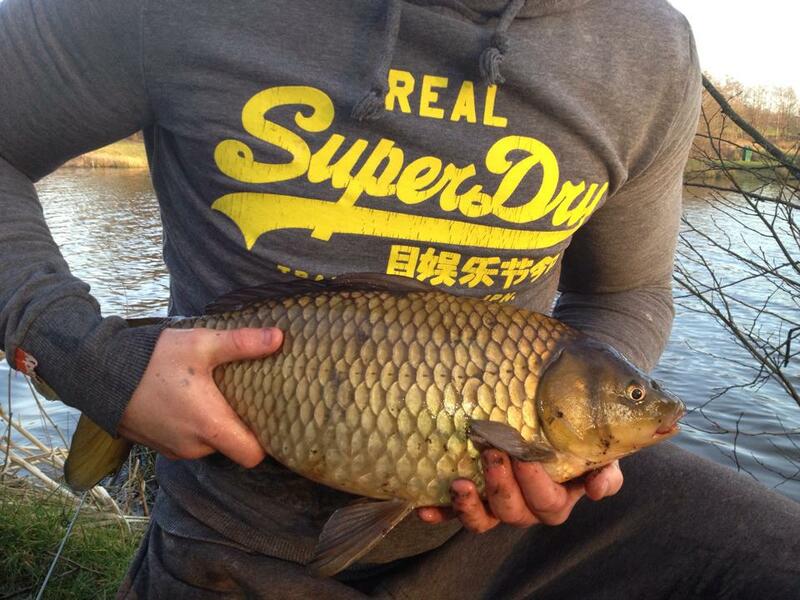 Carp like lakes, ponds and slow moving rivers. They can tolerate very low oxygen levels that would kill other species. Carp are omnivorous. They eat plants, insect, eggs, fish, decaying matter. Just about anything from Spam to watermelon is on their menu. Big head carp and silver carp are the newest species to North America. They were introduced accidentally in the late twentieth century. Consequently, big head carp and silver carp have not spread as far. Most of their range is limited to the Mississippi, Ohio, and Missouri Rivers. There are serious concerns about them spreading and the consequences they will have on the places they all ready inhabit. Big head carp and silver carp are plankton feeders. They swim around filtering out plankton from the water. Common carp are the most common species of carp in the US. They are light gold to dark brown in color and have large scales covering their entire body. They can be distinguished from buffalo and suckers by the little barbels on the corner of their mouth. A darker colored common carp. A lighter colored common carp. A mirror carp has a body and features similar to other carp except that it has extra large spotty scales instead of even consistently sized scales. A mirror carp with the large sporadic scale pattern. Some Mirror carp have scales covering their entire body. However, fully scaled mirror carp are different from common carp in that their scales do not form a perfectly symmetrical pattern, scales are often larger than normal and are not all the same size. Fully scaled mirror carp have scales that are too large and not perfectly symmetrical. Linear carp look a lot like mirror carp except that their scales form a pattern. Linear carp scales form a relatively straight line that runs across their back or side. A linear carp with the line of scale on the back. Linear carp have a thin line of scales across their side or back. Leather carp are a species of carp that have little or no scales at all. Leather carp have a body type and shape that is similar to that of common carp. Leather carp have few or no scales. 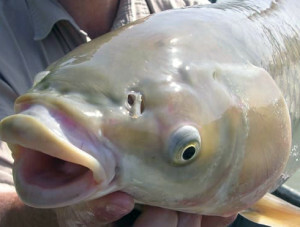 Ghost carp are white versions of the other species of carp. There are ghost commons, ghost mirrors, ghost leather carp and ghost linear carp. Ghost carp are not albinos. They have pigment in their eyes which are black instead of pink. Additionally most ghost carp are not pure white, they instead are extremely light yellow. A ghost common carp. Ghost carp are white or lightly colored carp. Koi a domesticated common carp that were bread for their exotic colors. Koi come in gold, black and white colors in various patterns and blends. Koi seem to pop up more frequently in bodies of water near populated areas, presumably after someone set the contents of their koi pond free. Orange koi are distinguished from goldfish in their size, fins and body type. Koi are larger, more long and narrow, and have smaller more pragmatic fins than goldfish. Koi have the body types of common carp but in shades of orange, black and white. Fantailed carp has long flowing fins. They are extremely rare and very easy to identify. This genetic mutation can be found in mirrors, commons, koi, ect. The are pockets of fain tailed carp in North America. 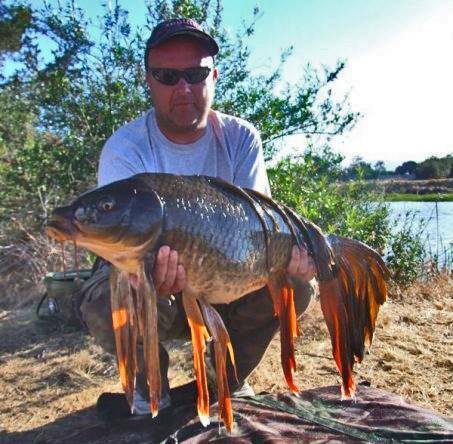 Karl Haymer of www.carppro.net sent me this awesome pic of a gorgeous fantail common carp that he caught in California. 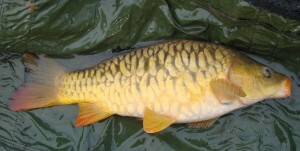 Crucian carp are a closer relative to the gold fish than the koi is. 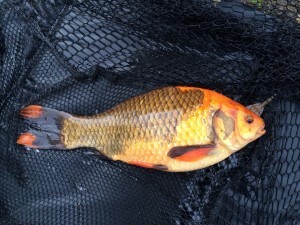 Crucian carp can have bright colors like a koi or be a more subtle earth tone the key to identifying a crucian carp is that it has not mouth barbels like a common carp, koi or mirrors ect. Crucian carp tend to have thicker bodies and tend to be only a few pounds at their largest. A large crucian carp. Notice that it has no barbels around its mouth and has a thick stumpy body. this crucian carp has pretty koi like colors. Crucian carp typically don’t get very big. 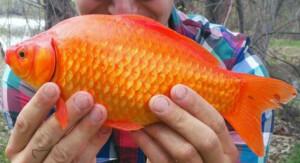 Gold fish come in many shapes and colors but they are generally smaller than most koi. Goldfish tend to have thinker, rounder bodies than koi and some species of goldfish have long flowing fancy fins. Gold fish are smaller and…look like your childhood pet. Grass carp are spread all over the US but they tend to be found in more places in the midwest and east. Grass carp were introduced into the US deliberately to help keep aquatic vegetation under control and they are still being stocked today. Grass carp, tend to eat more aquatic vegetation than other carp species. Grass carp differ in appearance in that they have longer bodies and no barbels on their mouths. Grass carp differ from bighead carp and silver carp in that grass carp have large scales similar in appearance to common carp. Grass Carp have a thinner bodies than common carp but they have larger scales than big head/silver carp. Grass carp don’t have barbels on their mouth and their mouths don’t point down as much as common carp. Silver carp and bighead carp are an invasive species that was used in water treatment facilities. Unfortunately, they soon escaped and have bred like crazy in the Mississippi, Missouri and Ohio rivers. When you see crazy Youtube videos of schools of carp jumping out of the water and hitting boaters int he face, those are silver carp usually. Silver carp and bighead carp are plankton feeders and can be caught using doughballs, bread and ground bait. Snagging for them is also legal in many states. Big head carp, like silver carp, are distinct from other carp because their eye is on the lower part of the side of their head. Silver carp look a lot like big head carp. Buffalo are not carp. They are the largest member of the sucker family and are native to North America. However they look like carp and are caught using very similar tactics so I included some pictures for comparison. Buffalo have no barbels but the can get well over 50 lbs. They are grayish-white, brown or black in color. CarpPro’s Austin Anderson with these massive 50+lb small mouth buffalo from lake Fork Texas. 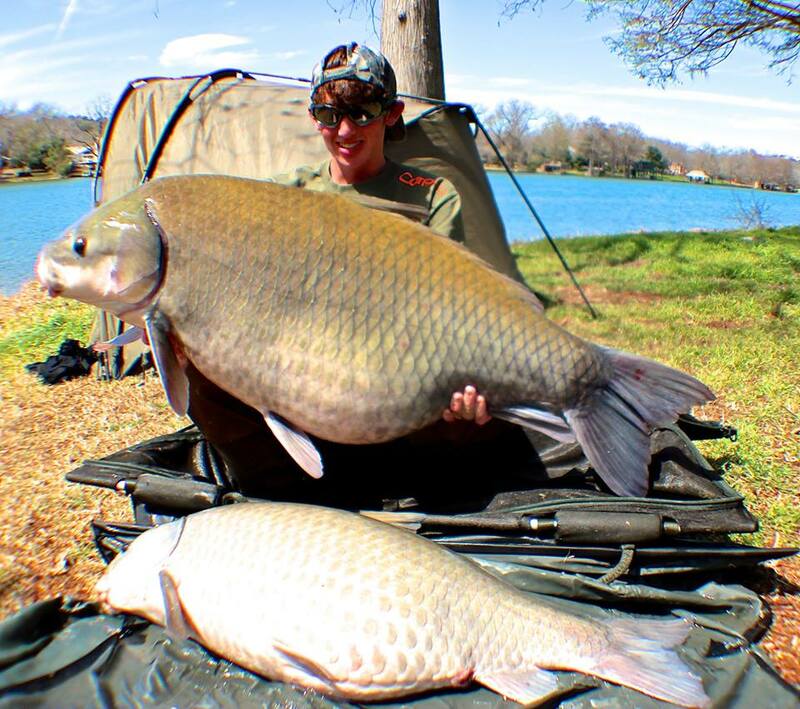 If you would like to catch one of these, you can hire Austin for a guided Texas carp and buffalo trip.